Strange events are occurring around the world, involving lights, sounds and flags that are hung in seemingly impossible to get to locations. At the meeting of the Weldon Institute in Philadelphia, PA, Uncle Prudent (President) and Phil Evans (Secretary) and the membership debate about whether their balloon the Goahead, should have its directional screw located in the front or the back. 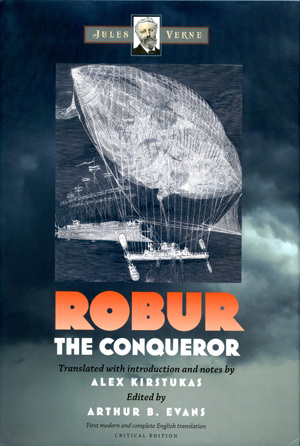 A man called Robur interrupts and takes over their meeting; he insists that to master the skies, a flying vehicle must be heavier than air. His remarks infuriate the balloonists and after their meeting, Uncle Prudent and Phil are kidnapped and taken on an around the world trip in the Albatross, Robur’s heavier than air “Clipper of the Clouds”. Translator, Introduction, and Notes: Alex Kirstukas; Editor: Arthur Evans. Middletown, CT, Wesleyan University Press, 2017. 288 pages, 43 ill.
One of Verne’s most compelling and enjoyable novels within his Extraordinary Voyages series, this is a very important work and an integral piece of the Jules Verne corpus. -- Review by Peter Schulman, translator of Jules Verne’s The Secret of Wilhelm Storitz, originally published on Arthur B Evan’s Academic website.